Around 250 tons of explosives were also seized in the nationwide coordinated operation targeting gun crime. 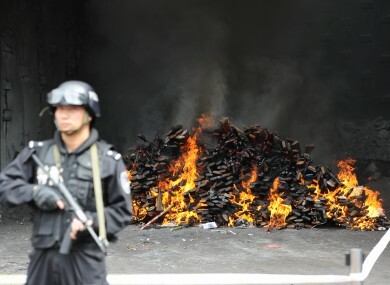 An officer guards a burning pile of guns in Yuxi, Tunnan Province. IN A COORDINATED operation yesterday, police officers in China seized over 100,000 illegal guns, 250 tons of explosives and a range of other illegal weapons in 150 cities across the country. The weapons are being destroyed at special depots and collection points in an ongoing operation Chinese officials say is helping to seriously cut the country’s gun crime. Some of the weapons were handed in by members of the public. China Daily reports that the national campaign targeting gun crime was launched in February and will continue until the end of the year, and that so far 7,800 suspects have been arrested in connection with the possession of illegal guns and explosives. Email “In pictures: 100,000 illegal guns seized across China”. Feedback on “In pictures: 100,000 illegal guns seized across China”.